This is indeed a ship with a dramatic history of its own, now enjoying a quiet retirement in the Viking harbour of Western Jutland. Havørnen (lit. The Sea Eagle ) was built by a team of volunteers in Norway, who later sailed it to the Faroe Islands. The trip ended in a dramatic wreckage near Thorshavn, but by 1992, the ship was ready for new challenges.This time, the route went East along the Russian rivers, all the way to Istanbul. In order to pass underneath the low river bridges of Russia, the stem and stern were sawn off, but have later been nailed back on. 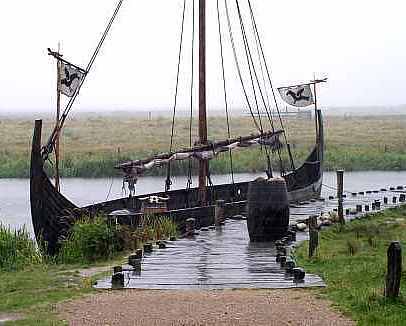 After having served as a backdrop in an entertainment park for some years, the Havørnen was bought by Skjern-Egvad Museum in 2001, and is today found in Bork Viking harbour in Western Jutland, where the low river water prevents the large ship from entering the open sea. 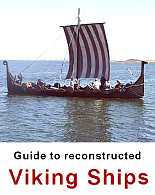 The museum, however, has built the 30 feet long Byrjargol, a replica of one of the smaller boats of the Gokstad find. This one is employed for tourist sailings. Terms of hiring: During the season, trips are offered in the accompanying ship of Byrjargol.